Here comes this dreamer. In Genesis 37 Joseph had a dream and shared it with his brothers and they hated him for it (v. 5). Sometimes our dreams are met with negative comments like, “It won’t work,” “You can’t do it,” “Impossible!” Imagine the negative words the Wright brothers heard when they dreamed of building a flying machine. Or Thomas Edison (light bulb) or Benjamin Franklin (harnessing electricity) or Eli Whitney (cotton gin) or Alexander Graham Bell (telephone). In the pursuit of their dreams they all must have had bad days and set backs and naysayers speaking words of discouragement. If they had given in to the negativity, none of us would be able to flip on the light and pick up the phone and order a cotton shirt from the store! But they pressed on. I also dream of and await that glorious day. My prayer for you is to keep on dreaming - not of the negative things that can happen, but of the positive things that will happen. Forty years ago I dreamed I could cross the Rio Grande into Mexico and could make a difference. Now, four decades later, I look back and see that difference. As I approach my 82nd birthday I still have dreams of things I would like to do. Join with me, and together we will dream, dream, dream. Greetings in the grace of our Lord. “What goes around comes around.” I have no idea where that old saying comes from but it has been around a lot longer than I have, and the truth of it can be found in both personal and biblical examples. What you do to others will be done to you, whether good or bad. “Give, and it shall be given unto you.” “What you sow you shall also reap.” What goes around comes around. In the early 1980s I arrived in Atoyac, Guerrero, a town about two hours northwest of Acapulco. Together we built a church, a Bible school, a medical clinic/hospital, and many mission churches in the surrounding hills. When I felt my work was complete in Atoyac I went to the state of Chiapas, on the other side of southern Mexico. There, with the help of many friends and workers, we built a major headquarters, more churches than I can count, a medical facility, and dormitories for various gatherings including training pastors. I stayed there until I sensed God saying, “Go to Oaxaca,” the massive state between Guerrero and Chiapas. Once again, with the help of many others, we built a beautiful major church there, a carbon copy of the one in Atoyac. But, what goes around comes around. Today I am back in Atoyac building a parsonage for the church pastor. There are grandparents in this congregation who were teenagers when I first arrived. What a great feeling it is to return to a place where you have given so much of your life and find it thriving and more beautiful than ever! Now I must go back to Tuxtepec, Oaxaca and build two mission churches, and go back to Chiapas to check on the progress of the church we are building in Tzabalho. There’s another saying that ties in with what goes around comes around: don’t burn your bridges behind you. For me, at least, with all this going around and coming around, I might need to cross those bridges again! Greetings and Happy New Year! I’d like to share a brief report of how 2018 ended and the new year is beginning. As I say each year, this last one was one of the very best: new headquarters completed in Tuxtepec, many mission churches built throughout Mexico (from the north to the south and lots of places in between), a very nice church including balcony started in Tzabalho, Chiapas, Christmas for the orphanage and for many children in the mountains of Chiapas. All of this was accomplished by so many people coming together for a common cause. Pogue Family Missions, Mexico Outreach, Mexico Ministries, and many medical teams have all united to make 2018 a great year, and I want to send out a big THANK YOU to each person and team. And of course, none of this could have happened without the faithful support of so many wonderful friends throughout the United States. Thank you all so very much! Now - what lies ahead in 2019: I just arrived in Atoyac, Guerrero where I am beginning construction on a parsonage for a local church. Next month I will be back in Tuxtepec building two new mission churches, then in March I will be in Atoyac again to continue work on the parsonage. When the Tzabahlo church is ready to be roofed I will return to help finish the church. While returning home from a brief trip to Louisiana to visit family, all of a sudden I felt impressed to ask God for eight more years of health to complete the ministry God has given me, “to do the will of Him who sent me and to accomplish His work.” (John 11.34) That will bring me to my 90th year. With the help of Jesus, Peter walked on water. With a boy’s lunch Jesus fed 5,000. By the Holy Spirit working through Peter and John, a man lame from birth stood up and walked (and even leaped!). With the help of God I believe I can make it. If so, we will have a party to end all parties, and if for some reason I don’t, we will have that party in heaven. Una fiesta que dura para siempre! December, 2018 GIVE GOD YOUR BEST! Greetings from Tuxtla, Chiapas. I trust that you had a good Thanksgiving and hopefully you had time to be with your family and friends. Life is so short, and we should treasure the times we have to spend with those we love. I am here in Tuxtla for our annual ministers convention. Many of these ministers were with us for the dedication of the new church in Tuxtepec last month. It was such a beautiful service and beautiful church building. Everything went perfectly. The speakers were all wonderful, the singing and worship was great, and the food was fit for a king. In fact, I felt the presence of the King of Kings and Lord of Lords throughout the entire day. New thoughts were birthed in my spirit that day and I will probably preach some of them soon, including, “Don’t offer God your leftovers, give Him your very best.” We certainly did not offer God leftovers in the building of the Tuxtepec church; we all gave our very best, worthy of the One who gave us His best - His only begotten Son. My agenda for 2019 continues to grow. In January I will be in Atoyac, Guerrero beginning construction of a parsonage for Pastor Jose. Hopefully it will be finished by his wedding in April. I will also build two mission churches in the Tuxtepec area beginning in February, and I must find time to build a rather large church in Tzabalho in the Chenalho area of Chiapas. A little over a year ago I stood on the property in Tuxtepec, Oaxaca, and in my spirit believed this to be the place that God wanted us to build the new headquarters for this region of Mexico. I considered the cost in time, finances, manpower and energy and asked, “Can we do it?” I remembered the words that Jesus spoke to a desperate father who wanted healing for his demoniac son, “If you can! All things are possible to him who believes.” (Mark 9.23). And the father responded, “I do believe. Help my unbelief.” Then I remembered what Jesus said to his disciples: “The spirit indeed is willing, but the flesh is weak.” (Matthew 26.4). I can also say to my Lord what Jesus said to the Father: “I have finished the work which you gave me to do.” (John 17.4). We have finished the construction, the dedication, the celebration of the new headquarters. Now what? I believe the Lord has already directed us to build two mission churches in the Tuxtepec area, and a parsonage for the new pastor in Atoyac. My spirit is strong, and all things are possible. My flesh says, “How?” But my spirit is strong! Probably both mission churches will be built. Probably the parsonage will be constructed. I just need to eliminate that word “probably” and say, “It shall be done,” so I can get a good eight hours of sleep without waking up in the middle of the night trying to figure out what, when, where, and how! I too have an “after this.” My “this” is the dedication of the completed Tuxtepec project on Saturday, October 27. I will be at the dedication service, but I won’t be speaking. If I were to speak, this is what I would say: I would thank all of the churches and individuals who helped with the finances to purchase the land, building material, and labor costs. I would thank Paul Pogue for sharing his vast knowledge of building large buildings without using heavy machinery. I would thank every group that came from the U.S. to help. 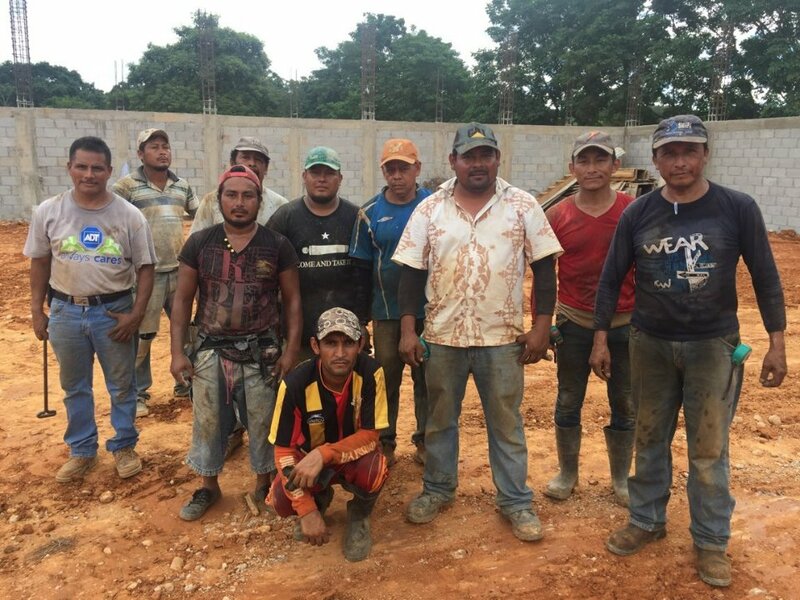 I would thank Pastor Carlos and his team, who made so many trips from Tuxtla, Chiapas, a six hour drive; not only did he come to work, but he also brought a concrete mixer, welding equipment, and other tools, and he also came to check the work and make sure it was being done correctly. I would thank Pastor Cesar for encouraging his congregation to help as much as they could, working on afternoons and weekends, and for organizing the women to provide food for us. I would thank Gerardo, the lead superintendent, and his men, for working six and sometimes seven days a week, often for twelve hours a day. These men live in Tuxtla, Chiapas and were away from their homes for a whole year, only seeing their families for two or three days every month or two. Since I won’t be speaking, I hope whoever does will mention some of these things. “After this,” I hope my book will read as Job’s did - that he lived a long life and died an old man full of days. I just returned from a month and a half stay in Mexico, and I think the devil is mad at me! While I was in Mexico a few unusual things happened back home. It took me $2,000 and a team of several men several days to find and repair a leak in a 2,000 foot gas line to the house. An oil leak in Mary Lou’s car caused the engine to burn up; another $4,500. A plumber had to be called because of a water leak. Another call to deal with a gas leak in the house after the line was repaired. I am in Mexico overseeing construction of the new headquarters in Tuxtepec, Oaxaca, and all of the responsibility for our home fell on Mary Lou’s shoulders. Why, then, is Satan angry with me? Look at the above photos (three sets of "before" and "now") and consider this may be part of the reason. If so, he will really be angry very soon! I have committed to building two more mission churches in Oaxaca, and a pastor’s home for the new pastor in Atoyac, Guerrero. The new headquarters are nearly complete and we will dedicate it to the Lord on October 27. What I need, and what I thank God for, is all of you who are friends who “stick closer than a brother” (Pro. 18.24). The devil comes against us, but God loves us. I know he loves me, and I know he has that same abundant love for you too! For the last month I have been in Tuxtepec, Oaxaca, working on the new headquarters there; for the next week I will be in Chiapas checking on the ministry there. And then before I go back home, I will visit Atoyac on the west side of Mexico to install a new pastor for the church there. After a short stay I will return to Tuxtepec and build a small house for a widow and her two children. It was God’s love and compassion that brought me the forgiveness of my sins, called me into ministry, and sent me to the people of Mexico. I don’t need a new ministry jet. I don’t need many of the things that others think they need. I just need the love and compassion of God to take me to the next village - by boat, horseback, mule, pick-up truck, or whatever will get me there - to tell them that Jesus loves them and has come into this world to save them from sin and death. Greetings once again from Mexico. Last month I was in Atoyac on the Acapulco side of Mexico, checking on the work there, and now I am back in Tuxtepec continuing the work on our new headquarters here. As I watch the new work coming together, I am once again struck by how much you have been and still are such a vital part of everything we do. Just saying thank you seems like such an inadequate response! Mexico Ministries was birthed in the early 1980s, and from the beginning this ministry was never about me and always about the people. In Mexico, God has given us great leaders and pastors, but it was never just about them. It was and is about the people. As we in the United States celebrate the Fourth of July, I am reminded of the immortal words of President Lincoln in his Gettysburg Address, “that this nation under God shall have a new birth of freedom - and that government of the people, by the people, for the people, shall not perish from this earth.” It’s not about the president, Congress, or politicians. It’s about the people. When I think of all the blessings that God has poured out upon we, His people, I am struck by the truth that we have received only a portion of our inheritance. I can only imagine what the rest of the inheritance must be - the eternal inheritance that awaits us in heaven. God loves His people and we will continue to share and demonstrate that love. Freely we have received, freely we will give. I give my deepest thanks to all the people who help us demonstrate that love. I’ve just returned home after a month in Tuxtepec, and am happy to report that the new church and dormitory are both progressing well, and I am rejoicing that as a nearly 81 year old missionary, this is the largest project I have ever undertaken! While in Oaxaca this time, I pondered the phrase, “What was, what should have been, and what can be.” Take the prodigal son (Luke 15), for example. What was: a young Jewish man who squandered everything and found himself living in a pig pen. What should have been: he should have never left his father’s side, and enjoyed the blessings of home. What could be (and in this case did happen): he returned to his father’s open arms and was reconciled to his place in the family. History is full of what was, what should have been, and what can be. Just two examples: the Navajo Code Talkers, Native Americans who were mistreated, but served their country with valor. The same for the Tuskegee Airmen, black men who were treated as second class, but gave their all for the cause of liberty. What Was: Ulises (Ulysses), the young man in the photo on the back, was abandoned by his father at birth and never knew him; instead he was raised in abject poverty (see the photo of his mother and brother in front of their home). What Could Have Been: Ulises could have been raised by a loving father who nurtured and provided for him until he was old enough to build a good life for himself. What Can Be: We plan to help Ulises build a home for his family and have a blessed future. When it is all said and done, that is what Mexico Ministries has been about for 40 years: making what should have been into what can be. This is the work of the Kingdom of God, and I am so grateful to the many partners and friends over the decades who have helped us turn around lives from what was into what can be! Greetings from Tuxtepec, Oaxaca, Mexico. I was here for 46 days straight, spent a couple of weeks at home, and have now returned to Tuxtepec. I hope you are as delighted and encouraged as I am when you see the pictures (on the back of this letter) of the progress being made here. I was meditating recently about how many great people in the Bible were also great sinners who were forgiven by great grace. David, the greatest King of Israel ever, also committed some of the greatest sins ever. He broke at least half of the 10 Commandments, but God’s grace was sufficient to redeem him! Rahab was a prostitute who was redeemed and became an ancestor to David and to Jesus. The Apostle Paul was a persecutor of Christians who delighted in their deaths and called himself “the chief of sinners,” yet God saved him, transformed him, and used him mightily. Why is it so easy to judge and condemn, and so hard to forgive like God forgives? This is something I need to work on continuously. In Romans 7.19 Paul wrote, “For the good that I want, I do not do, but I practice the very evil that I do not want.” I tend to judge others by my standards, my culture, my customs. My culture comes from light years ago! New cultures are being formed daily. I may not be able to embrace them, but who has given me the authority to judge or condemn them? Maybe I should concentrate instead on the words of Christ clearly directed toward me: “Do not judge so that you will not be judged…How can you say to your brother, ‘let me take the speck out of your eye,’ when there is a log in your own eye?” (Mt. 7.1,4) I don’t have a log in my eye. I have an entire forest in both eyes! I am still in Tuxtepec, but will be home by the time you receive this newsletter. Great progress on the building here continues, and I want to give a special thank you to Pastor Sam Walker, Tom Shaffer, and the Agua Resources team who have been here trying find water on the land - we haven’t yet, but we are keeping at it. You may not know this about me, but I really enjoy working a garden. I call my garden, “down by the pond,” and I plant onions, tomatoes, okra, black eyed peas, and other vegetables. I like them by themselves, but they taste so much better when they are cooked together. God has a garden too, and I’m sure he loves his more than I love mine. God started history with a garden, placed a man and a woman there, and dropped in for visits with them there. The Church is a kind of garden of the Lord’s, and it has a great variety growing in it. The Body of Christ is made up of many different people and ministries; “For just as we have many members in one body, and all the members do not have the same function, so we who are also many are one body in Christ, and individually members of one another” (Romans 12.4,5). God’s garden has such a wide variety of plants, all bearing fruit. We may call them denominations, God calls them His children. God’s children are as diverse as the flowers of nature, and together make a beautiful bouquet that He delights in. Red, yellow, and pink roses; orchids of every color, and here in Texas Indian Paint Brushes and Bluebonnets. In my garden I even have vegetables that I don’t personally eat - turnips! I grow them because Mary Lou likes them. I don’t condemn them; they’re part of my garden. Are you getting the point I’m trying to get across? Why don’t we walk with the Lord in the cool of the day and enjoy the diversity of his garden? After all, we’re going to spend eternity together, so we maybe ought to start appreciating those who are different from us in the here and now. Even the turnips among us! Greetings from Tuxtepec, Oaxaca, where construction on the new church is going well and according to schedule. I arrived here on February 5th and will stay until March 9th. When the wine ran out in the story of Jesus’ first miracle at the wedding in Cana of Galilee (John 2), Mary the mother of Jesus told the servants, “Whatever He says to you, do it.” Jesus told them to fill empty pots full of water and moments later he miraculously turned the water into the best of wine. They heard and obeyed and a miracle happened. “Whatever He says to you, do it.” I have tried to be faithful to these words since God called me into ministry sixty years ago, and God has blessed me every time I have obeyed. This doesn’t mean it has always been easy or without problems, but God is faithful and will complete what he begins in and through us. Throughout Scripture, God blesses those who hear and obey, beginning with Abraham hearing God call him out of Ur into a promised land (Genesis 12). On the other hand, some hear and do not obey; Jonah comes to my mind. God told him to go preach in Ninevah and instead he fled in the opposite direction. We all know that did not end well for Jonah! There are consequences for not heeding God’s voice, and there are blessings when we do. What is God speaking to you? Keep a keen ear to the voice of God. Sometimes He speaks in a storm like roar, but more often in a “still small voice” (1 Kings 19.12). Hear Him. Trust Him. Obey Him. I thank God for those who have heard God speak to their hearts to join us in this new project in Tuxtepec, and I thank each one of you for your prayers and support. Together we are hearing and obeying, and together we will reap the blessings of a great Kingdom harvest both now and in the age to come. For the last month I have been in Tuxtepec working on our new church and headquarters for the state of Oaxaca, a commitment we made last year. I started thinking about the word commitment and looked it up - it can mean a promise, pledge, or vow; a commitment is not something we should take lightly. In the early 70’s I made a commitment to build Evangel Temple in Denison, Texas. Finances were tight and I did much of the work myself, with very little financial support from the church. It was a tough time, but I made a commitment and was determined to keep it. At the time, I told our secretary, “If need be, I will sell my home to make this happen.” She said, “If you sell your home, then we will sell ours!” Thanks be to God neither of us had to sell our homes and the church was completed. But we were committed at all costs. In the Old Testament, Ruth made a commitment to her mother in law Naomi that, “Where you go, I will go, and where you lodge, I will lodge. Your people will be my people, and your God will be my God.” It couldn’t have been easy, but she kept her promise, moved to a land she did not know, and ended up becoming the great grandmother of King David, and an ancestor of Jesus. Commitments are serious business and ought not be made lightly. We make commitments in marriage, family, business, church, politics, and many other arenas. What would the world be like if those commitments were actually kept? Thankfully, God keeps his commitments to us! “Go into all the world and make disciples of the nations, baptizing them in the name of the Father, and of the Son, and of the Holy Spirit. And lo, I am with you to the end of the age.” Jesus made the commitment that if we go, he will be with us. And we are responding with the commitment, “Yes, we will go.” Thank you for your commitment as partners to stand with us in prayer, financial support, and so many other ways. The new year is here and we should start it out right, but how? The Apostle Paul wrote, “forgetting what lies behind and reaching forward to what lies ahead...” (Philippians 3:13), to which I would add, forgiving what is past. Unforgiveness becomes a tremendous weight that keeps us from moving forward into what God desires for us. I am reminded of the story from Genesis 27 where Jacob stole Esau’s blessing and, “Esau bore a grudge against Jacob,” planning to kill him the next time they met. For twenty years Jacob lived in fear. For twenty years Esau bided his time. When the moment arrived, Jacob saw his brother coming with 400 men, but instead of raising a battle cry, Esau ran to his traitorous brother, embraced him, kissed him, and the two of them wept together. I’m sure they wept with a surprised joy, but also probably tears of sorrow over what had been lost the last twenty years. In Acts 15 a dispute arose between Paul an Barnabas over whether John Mark could go with them on a missionary trip. It was so hot that the two men of God parted ways, Paul having nothing to do with Mark, while Barnabas took him alongside. Years later, toward the end of his life, Paul wrote to Timothy and said, “Do diligence to come to me shortly. Take Mark and bring him with you, he is profitable to me for ministry.” We don’t know if there were tears shed at that reunion, but there was forgiveness given from both sides. We all have encountered strained relationships and hard feelings. I for one refuse to carry them into 2018. Instead, I choose to heed some other words from Paul: “Old things are based away, all things are become new” (2 Corinthians 5.17). We are new in Christ. All things are new. And it is good to revisit this newness that is ours as we approach the beginning of a new year. Speaking of new - the new church and ministry center in Tuxtapec is moving forward beautifully, and we plan to have the roof on sometime this month (check out the pictures on the flip side). Thank you so much for joining with us in making this new phase of ministry a reality. Greetings from a little yellow tent in Tuxtepec, Oaxaca. I suppose I could stay in a hotel, but the core team of workers here have traveled from Tuxtla, Chiapas, leaving behind their friends and families, and are camping in a small run down building on the church property. They’ve been here since September, and I am with them the entire month of November. My plan is to spend most of 2018 in this same spot. In Exodus 32, God was so put out with his people because of their idolatry and stubbornness that he wanted to destroy them. Moses intervened and begged God to turn from his burning anger, change his mind, and save the people. The Lord relented when Moses stood between God and Israel, willing to sacrifice his life if need be. The need was greater than the sacrifice. I sat in a one room shack and held the hand of a frail, dying woman. She had paid two witch doctors to heal her but only grew worse. I had been on the road for three days and was tired, hungry and dirty, but the Holy Spirit spoke to me and said, “You will have another day to eat, sleep and rest. This woman will not have another day to live.” Her need was greater than my sacrifice. I prayed for her and later found that she had fully recovered and as a result her entire family had given their lives to the Lord and had been baptized. As we enter this holiday season, let us be sensitive to the Spirit of God speaking in our hearts, and let us care for the needs of others - sometimes their need is greater than our sacrifice. Greetings in the love of Jesus our Lord. October was a very busy month for me and the ministry, and November promises to be active too. In October I was in Tuxtepec, Oaxaca with a group of 20 men from McKinney, TX who worked hard on the foundation of the new ministry center there. I also made a trip to Chiapas to survey the earthquake damage, and met up with a church group from Missouri who helped build a new mission church there. I have seen one of the largest Banyan trees in the U.S. in Maui. It spreads out wider and wider. It looks like many trees, but it is all one tree. It’s branches put down roots, but the branch is still connected to the main tree. The largest Banyan tree is in India and it spreads out over almost 2 hectares (or 4.67 acres). The Great Banyan looks more like a forest than an individual tree. Another Interesting fact that I learned this morning about the Banyan tree. The largest tree in India now survives without its main trunk, which decayed and had to be removed in 1925. God says that you have been like this Banyan tree and have cared well for the churches and people that I have put in your heart. You have insured that they were healthy and you have provided for them. And God wants you to know that because these churches have put down roots and have become solid and strong, that even when you are no longer able to care for them they will continue to grow strong and branch out and put down more roots. You have taught them well. You have done your job exactly the way I have led you. And you can be assured that this ministry will continue even after you are no longer able to come and go because they have put down roots and will continue to grow strong. Visit https://www.facebook.com/MexicoMinistries/ for a short video about the Banyan tree. I suppose I could give a dozen different answers to that question - a dozen reasons to stay in the game and not sit on the sideline. But the answer that burns in my heart right now is, “I do it for the sake of the children.” Beyond the mountains in Oaxaca lie the valleys scattered with villages where families live; men, women, and children who know nothing of the great love of God. Those towns are home to children who have never been to Sunday School or Vacation Bible School, who have never sung, “Jesus loves the little children, all the children of the world…” It is important to reach the present generation with the Gospel, but reaching the next generation is where the real transformation happens. We do it for the sake of the children. Those children will grow up formed in Christ and knowing and sharing the Good News of Jesus. Those children will be the ones who make a difference long after I am out of the picture. There is a story in Exodus and Numbers where the people of Israel refused to enter the Promised Land out of cowardice, but they used their children as an excuse for not crossing the Jordan. Sadly, that generation died in the wilderness and it was their very children who crossed over forty years later. We are determined to not make that same mistake. We are committed to going forward for the sake of the children. Jesus said, “Let the children alone, and do not hinder them from coming to me: for the Kingdom of Heaven belongs to such as these (Mt. 19.14). And, please don’t forget, that there was that one old man, Caleb, who also entered Canaan at the age of 85. So, I still have five years to catch up with him. Now is not the time to stop. Now is the time to move forward. For the sake of the children. Well, July and August have been whirlwind months and September promises to be one too. I flew to Chiapas and then drove to Oaxaca where we spent a couple of days checking the progress of the Tuxtepec project, and I am pleased to announce that things are moving smoothly and quickly, and construction work should begin the first week of October! In the meantime, I have been overseeing the completion of two new mission churches in the mountains of Chiapas. On July 30, I celebrated my 80th birthday, so I am now officially approaching being an old man! In the last six years I have had back surgery, knee surgery, a stroke, and several subsequent spells related to that stroke, so clearly I can’t do the physical work I could when I began this missionary work in my early 40’s. But my heart, mind, and compassion are as strong - no, stronger - than when I first began. And, so, I enter my ninth decade of life with a sense of purpose and vision rather than resignation and retirement. For much of the rest of the year I will be in Oaxaca working on the new “mother church” there. Thank you for standing with me all these many years. Here’s to many more to come!